It’s September, and in a matter of weeks, my first daughter will be born. In a rush of summer cleaning and nesting, reading parenting books and planning-planning-planning, I have also found myself searching for books to begin my daughter’s library, as well as books and resources that may assist in raising my daughter in the best way possible in the midst of today’s expectations. I wish I only meant researching the best schools and starting a college fund; but, unfortunately, what I’m researching extends into far more personal territory: how my daughter will potentially measure her self-worth . . . and even how she may measure others’. Dr. Rebecca Hains, author of The Princess Problem: Guiding Our Girls through the Princess-Obsessed Years, offers a thorough and insightful text which presents research surrounding the princess mentality that has infiltrated our culture; the pleasures and problems this mentality presents; and how we as parents, guardians, and mentors can teach our children to better navigate and overcome the shortcomings of this mentality, without completely dismissing the fun of princessdom. The book is systematically divided into two parts. The first focuses on Dr. Hains’ research methods surrounding the princess problem, as well as background and summative information in support of why this mentality is problematic and how we can begin thinking of correcting it. The second part breaks the princess problem down into subcategories, unpacks their meaning and role within the problem, and presents subcategory-specific solutions. I was drawn to this text originally for a variety of reasons—being a declared feminist, having a background in Gender and Women’s Studies and Psychology, being a soon-to-be-mother (of a daughter, no less), and having my particular background as an onlooker (to friends raising their daughters)—but I was also interested in what it could teach me about what I did not experience as a child. While I have certainly witnessed the princess obsession that now appears to enslave childhood, I was not in the least way interested in dolls, Barbie or princesses; in fact, whenever I was given one, or given a gift that was glaringly pink, it often would remain in its original package or stored away on some unreachable shelf in my bedroom. Instead, I played with dinosaurs. And Hot Wheels cars. And more dinosaurs (Jurassic Park was huge when I was little and was the first movie I ever saw in theatres, so that ended up being more of my obsession). I guess I saw dolls and their equivalents as boring; there wasn’t all that much to do with them but dress and undress them, and playing dress-up was a hassle, not a joy. I wanted to run around outside, roll in the mud, and come back inside to scatter my cars and dinosaurs all over the room. I wanted to play with blocks and build things in kindergarten with the boys. And I wasn’t interested in all the mean things the girls said or the jewelry they played with at recess; I wanted and found kindness, comradery, and a healthy level of competition running around with the boys instead. Perhaps “obviously” this led to problems in my relationships with other girls and my willingness to confide in them later on; dealing with boys was so much easier. What’s interesting, though, is that this all so largely stems from those earlier desires: I chose to play with dinosaurs and cars instead of dolls and clothing, which impacted who I played with and how I played, which led to potentially-different relationship and gender development. I witnessed a glaring princess obsession in other girls (though, I did not note it as a “princess obsession” at the time but, rather, noted their excessive pink clothes, jewelry, make-up and fascination with boys) and also made note of how those girls were treated differently than the girls who were more like me. Looking back, there was a hierarchy to navigate. By living outside of the princess obsession, I was able to progress in ways dissimilar from the other girls, focusing far less on appearance and romantic relations with boys (I didn’t fantasize about getting married until my husband proposed, and I didn’t worry about my appearance until midway through high school), though I did feel like an outcast and was largely shunned by those around me for being different, and still feel this shunning in other settings to this day. I bring this up, because so much of this seems to correlate with the princess problem and our culture’s princess mentality. The subcategories of the princess problem include a fixation on romance and physical (outward) beauty, a lack of realistic gender and racial diversity and representation, as well as the overwhelming obstacle that is childhood marketing (toys, clothing, snacks, etc.). When considered from a psychological and sociological standpoint, this combination of shortcomings may dictate to young girls who they should be (in the sense of appearance and beauty), what they should do (by way of career) and who they should have relations with (emphasizing, often, popularity and romantic relationships of limited means). To look at this from a broader standpoint, much of what is presented by this princess mentality attempts to teach our girls what it means to be a girl, what she should value, and how she should measure others’ success as individuals and members of our society. Looking back on the girls who I grew up with and their behavior, I can see how their involvement with princesses and other-girl specified items (as well as how they were raised to view themselves as princesses, or were encouraged to view themselves as ‘of a higher variety’) might have influenced them, their behavior and their decisions. If less time had been spent on fairy tales, make-up and valuing outwardly-assets, as opposed to developing deeper and more meaningful relationships, these girls potentially would have been much more open-minded about who they could and would interact with, which very well may have impacted their later personalities and decisions. I’m really not here to demonize girlie toys, make-up, princesses, or the color pink; nor do I feel that this is the goal of The Princess Problem. Though playing dress-up and wearing make-up and playing with dolls were not my first choices of entertainment, I have had enough friends over the years, watched enough family members get ready for going out and have babysat enough children to understand the appeal of these activities. I will even go so far as to say that I can see their merits, despite their potential limitations. Like many other things that we present to our children—perhaps questionable television, or video games, or even just spending too much time indoors—there are ways of striking a balance. I believe, as Dr. Hains does, that allowing our children to be exposed (at least somewhat) to the princess mentality not only presents us with teachable moments, in which we may teach our daughters (and sons) greater critical thinking skills, as well as methods of further navigating the media, but we can also fixate more so on those areas of princessdom that are actually of higher quality—as love, generosity, and giving of the self should not be viewed as negative attributes, assuming these are given willingly and for the right reasons, and to the right people (which could easily be discussed, and even debated, in some of our princess films). This relates specifically to Dr. Hains’ central idea and solution against the negative aspects of princess mentality—that is, our ability to better-navigate, critique and use the media, our pop culture, and even the deviations between the values presented by the princess mentality and our current cultural ideals. Dr. Hains refers to parents, guardians and mentors as “pop culture coaches,” who are able to look at the stories and films presented to our children, as well as the items sold to our children (and what they suggest about a child’s ideal behavior), and the values and goals that are suggested by these products—and teach our children how to look at all of these things with a critical eye, question their merit, and adjust their acceptance of the products and their messages based on the values and perspectives preserved in their own home. These are abilities that can only strengthen our children’s later critical thinking skills, and it gives them the opportunity to begin questioning moral ambiguity, as well as seeing the “gray” in what the media often tries to present as “black and white”. In addition to her unpacking of the subcategories of the princess problem in Part 2, Dr. Hains also unpacks potential solutions for each of these subs (for girls and boys), and she also has a variety of tools and resources available on her website, which include parent-child discussion guides for each of the Disney princess films, as well as pop culture coaching tips for beyond the princess problem, which includes other areas of media-fixation. Being a soon-to-be mother and having the academic background that I have, I cannot recommend this book and its supplemental resources enough. There are obviously potential social and psychological problems that can arise from presenting princess stories (and their equivalents) to our children; but because of the overwhelming presence of princesses in our culture, our children will be exposed to these stories whether or not we are the ones who share them: in their schools, when with friends, by their friends’ parents, etc. So in the long run, then, it seems to me that it would be better to somewhat-expose my children to these ideas, but only alongside the appropriate critical thinking skills. I do not mind the idea of my children enjoying a story if they can also point out its specific merits, why they like it, and where it might fall short. If they have a clear understanding of how beauty is over-emphasized, how gender and race need better and more-frequent representation, and that being a princess is not everything, then that opens the door to sharing with them the actual merits of these stories: overwhelming love, a positive relationship with nature (that’s always been my favorite part about princess tales—wanting to sing with birds and clean my home with a whole herd of forest friends), having confidence in personal beauty (though, again, striking that balance! ), as well as love and respect that are at times awarded and valued between the princess and supporting characters. I love this idea of being able to share this large aspect of our culture with my daughter, while also seeing her as able to move beyond it and find empowerment despite her involvement with it—measuring her success in actual successes, rather than in beauty and popularity and the like. That, to me, is beautiful: that possible middle-ground of embracing something so large from our culture, but also challenging it and moving beyond its limitations. DR. REBECCA HAINS is a children’s media culture expert. She is a professor of advertising and media studies at Salem State University in Salem, Mass., where she is affiliated with the Center for Childhood and Youth Studies. Her research focuses on girls, women, and media. 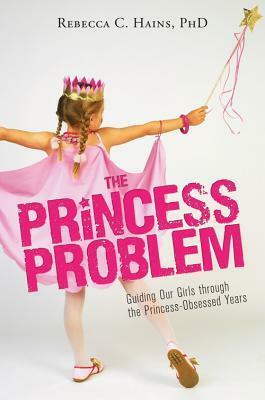 She is the author of The Princess Problem: Guiding Our Girls through the Princess-Obsessed Years (Sourcebooks, 2014) and Growing Up with Girl Power: Girlhood on Screen and in Everyday Life (Peter Lang Press, 2012). She has published essays in various scholarly anthologies and peer-reviewed journals, including Popular Communications and The International Journal of Girlhood Studies. She is currently working on an anthology called Princess Cultures: Mediating Girls’ Imaginations and Identities (co-edited with Miriam Forman-Brunell).